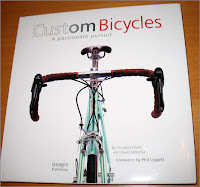 I recently had the opportunity to review a beautiful new book on custom bicycles, and my comments have now appeared here at www.pezcyclingnews.com. Enjoy! I like reading your reviews. They always make me wanna rush out and buy the book. So you are aching for a Llewellyn? I'm going to ride with my friend John this afternoon, who happens to ride a beautiful Llewellyn frame and evertime I sit on John's wheel I admire this tiny little heart ornament on his seat tube ... John is good friends with Darrell and rides with him frequently. The level of craftsmanship is something special. Great review! A bit of a tease though as it's not available in Canada until late May. I've ordered my two copies and now I must wait...it will make it that much sweeter once it arrives. Those of us with Special Connections get advance review copies!